One of the things you notice while digging into old records is the strange ways our ancestors wrote the names of people and places. The word Monacan was spelled as Monagan, Monskane, Maniken, Monakms, along with other synonymy. Thus, when the old Land Grants of Amherst County record that Robert Johns acquired ninety-two acres on both sides of “Porridge Creek” in 1758, you are compelled to ask yourself, was it really “Porridge Creek” or was it something sounding like “Porridge Creek.” In fact there is no record of a “Porridge Creek” on a recent map of Amherst County. Perhaps an historical tangent will resolve this contradiction. William Evans was granted land on Stovall Creek in 1791. Since it was known that Billy Evans and Robert Johns were friends, they were probably neighbors. And since Stovall Creek runs parallel to the present Partridge Creek in southern Amherst County, it stands to reason that Partridge Creek was the original “Porridge Creek.” Further examination of older maps reveals that indeed “Porridge Creek appears where there is now Partridge Creek. Whether or not Robert Johns et al. could pronounce or spell Partridge Creek correctly at the County Clerk’s office, these records verify that he was the first Johns to live in Amherst County. Like his trader predecessors, he migrated up the James River from Richmond. There was a William Johns recorded in Chesterfield County north of Richmond in 1752, a short distance down the river from where Thomas Johns settled in 1737. Later, in 1750, other Johnses (John and William) owned land further up the James. Robert’s name appears in Amherst County while it was still part of Albemarle, in 1758. It follows that the Johnses, as kinsfolk, were moving up river during the 1700s. There is other documentation, maps, which establish the presence of the Johnses in western Amherst County just above Lynchburg. Johns Creek enters the James from the Amherst County side, and Johns Hollow on the opposite side, no doubt named for Robert or his kin. A Johns is shown on a map about two miles to the north of Johns Creek owning land at the headwaters of Salt Creek in 1864. Like the Indians who lived on the creeks, we find numerous records of the Johnses and Evanses located on these scattered streams of the county along Partridge (“Porridge”), Stovall, Johns, and Indian Creeks, and the Buffalo River. As we learned from the trader-frontiersman period, the mouths of these creeks along the James were the future sites of vigorous commerce. Salt Creek serves as an example. From the period between 1750 and 1850, we know a mill, a tavern, and a ferry were established at the now defunct town of Bethel. Bethel evolved from a trading post at the Salt Creek confluence, and was a social and economic meeting ground for Indians and Whites for a century or more. When the tavern opened in 1821, settlers along Tobacco Row and environs would congregate at Bethel, the oldest incorporated town in Amherst County. 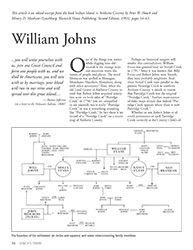 It was at the time of the developing river commerce in 1790 that Will Johns and Molly Evans were married. It is not known exactly where the couple settled, but they were very likely living near Bethel since it was the only place where Johnses were recorded at the time. We find them next, forty years later in 1833, when William Johns purchased over four hundred acres on Bear Mountain from Landon Cabell, descendant of Dr. William Cabell. This purchase established the first and only modern Indian settlement in Amherst County. When Will Johns, at age sixty-three, paid four hundred dollars for four hundred acres on Bear Mountain, he was trying to establish a place where he and his family could reside apart from the prejudices of the rest of Amherst County. He had purchased forty-two acres of adjoining land two years previously. 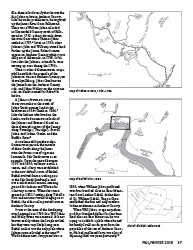 This article is an edited excerpt from the book Indian Island in Amherst County by Peter W. Houck and Mintcy D. Maxham (Lynchburg: Warwick House Publishing, Second Edition, 1993), pages 54–63.